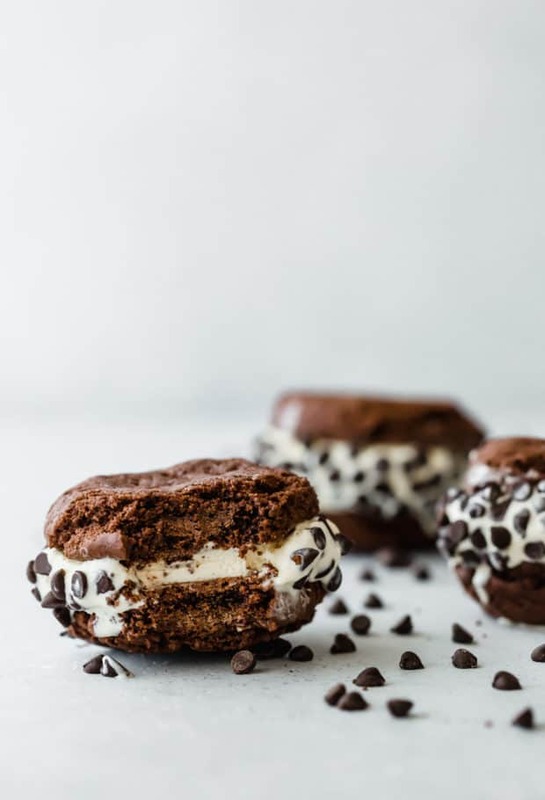 Chocolate Cookie Ice Cream Sandwiches are the official go-to treat for the summer! 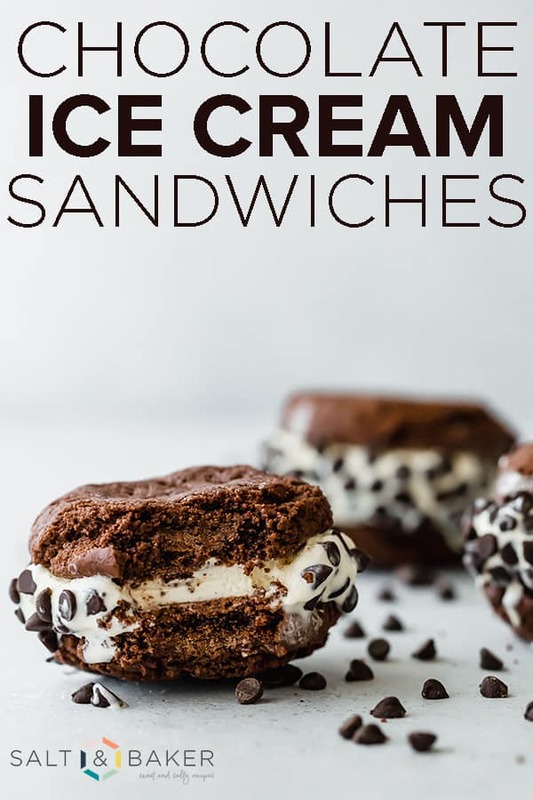 Adults and kids gobble these perfectly portioned ice cream sandwiches right up! 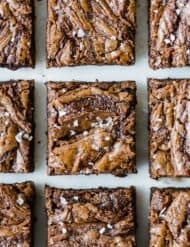 Have you made my Double Chocolate Chip Cookies yet?! Add it to your to-do list! But really, the cookies (and the cookie dough) tastes amazing! 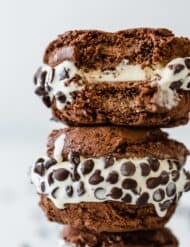 In fact, it was the double chocolate chip cookies that inspired these Chocolate Cookie Ice Cream Sandwiches! 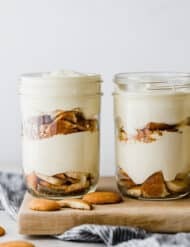 I had some leftover Homemade Vanilla Ice Cream sitting in my freezer a few weeks ago and wanted to make something new. I’ve received a lot of comments and messages from readers telling me just how much they’ve loved the Double Chocolate Chip Cookies. So I decided to use that chocolate cookie base (minus the chocolate chips), and use it for ice cream sandwiches! Think of allll the ice cream cookie sandwich combinations you can make! 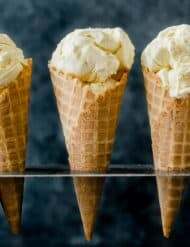 You could make ice cream cookies with gingersnap cookies, chocolate chip cookies, sprinkle cookies, oatmeal zucchini cookies, pumpkin cookies, cake box cookies, sugar cookies, the list goes on and on! This ice cream sandwich is a classic. 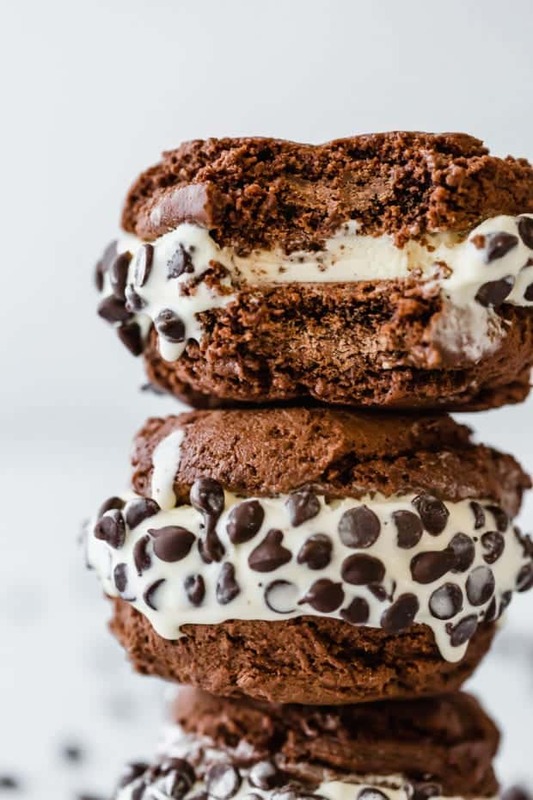 You have a rich and creamy vanilla ice cream sandwiched by two soft and chewy chocolate cookies. 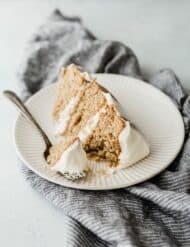 This ice cream sandwich is guaranteed to bring a smile to everyones face who eats this simple and fun dessert. Don’t overcook the cookies. When you place ice cream between two cookies they’ll get harder (because they’re getting cold from the ice cream). You want to have a soft cookie so that you can bite into the ice cream sandwich without breaking your teeth, and risking the sandwich crumbling to a million pieces. Thick cookies. But not too thick. 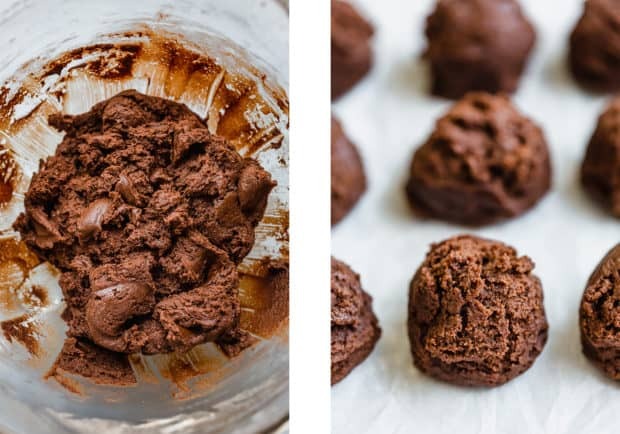 This double chocolate cookie recipe produces a plump and thick cookie! In fact, you’ll notice in the recipe directions that I instruct you to lightly flatten the cookie with your palm. I do this so that the cookies won’t bake into a dome shape. The slightly flattened cookie will make for easier eating, better structure, and perfect ice cream to cookie ratios. The finishing touch that ensures you’ve made the perfect ice cream cookie sandwich is to add some nice texture. When I say texture I mean, mini chocolate chips! After assembling the ice cream cookies, roll the ice cream portion in mini chocolate chips. 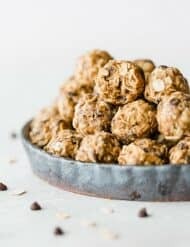 This small addition adds a nice crunch and fun flare! Have fun with these ice cream cookies! 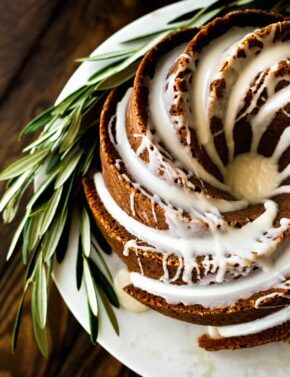 This recipe can be adapted in so many ways. It would be yummy to add a spoonful of caramel between the cookies, or how fun would it be to roll the ice cream portion in Fruity Pebbles or even nerds?! 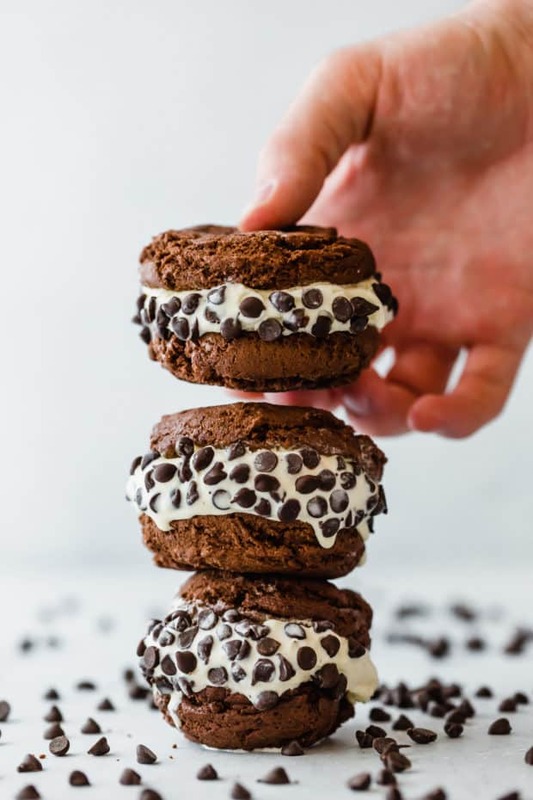 Delicious vanilla ice cream sandwiched between two chocolate fudge cookies, and then rolled in mini chocolate chips... it's the perfect summer treat! Once cooled. Add a scoop of vanilla ice cream to the bottom side of 1 cookie, take another cookie and sandwich together. Immediately roll the ice cream portion in mini chocolate chips. 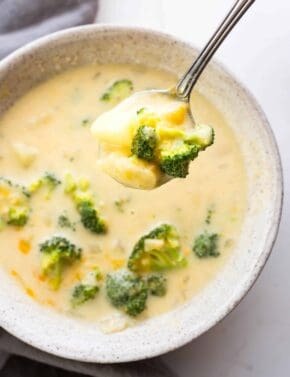 Place in an airtight container to freeze and enjoy later, or you can eat immediately! *By gently pressing the cookie down, it makes the ice cream sandwich cookies flatter and a bit more manageable. It's fine if you choose not to press down the cookies... you'll just have some round ice cream sandwiches! **Nutrition facts do not include the ice cream. I love making ice cream sandwiches at home! It’s the perfect treat on hot summer days! 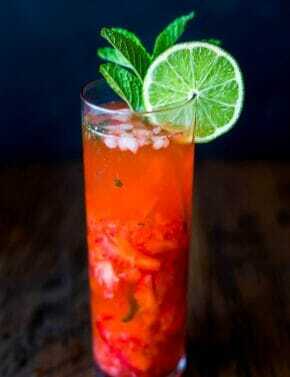 Looks soooo tempting!